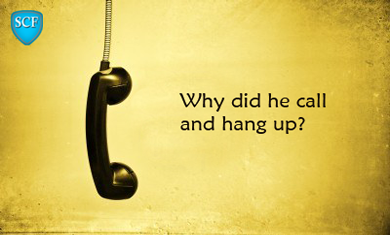 When someone calls repeatedly and hangs up, it could be a major nuisance. It could be some one previously known to you. Try blocking the number. If ID is hidden, contact your network for help. If none of these work, contact police. Keep in mind that there are scammers who want you to call them back and play tricks on you. They may use computerized caller devices which make automated calls to thousands of numbers. When you call back, either a call center robot or a human would attend the call. Unless you are absolutely certain who you are talking with, disconnect the call. Be aware that the call might have come from a premium line and when you call back you would be charged at 4 or 5 times the usual international call rate. It’s a usual practice to play recorded message while the caller waits endlessly for someone to attend the call. When the bill lands up you would notice you have been charged at premium call rate for the time you waited! Spread the word about the number from which the call comes among your friends. If its someone known to you, he/she would back off. Learn to be rude and impolite with scammers.